Graphic Design USA (GDUSA) has awarded NJ Designs’ founder and creative director Natalie Ede with an award for her outstanding design work on the Washoe County Medical Society’s bi-monthly publication the WCMS Communicator and will be featuring her award-winning design in their latest publication GDUSA. This year there were over 1,000 entries; a highly selective 15 percent were selected for recognition. 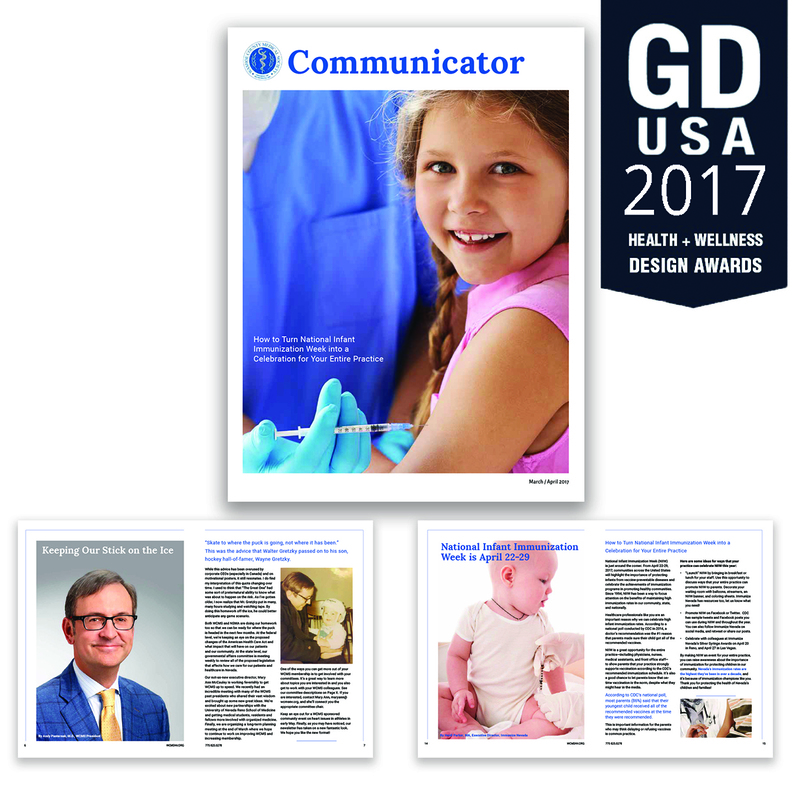 Graphic Design USA (GDUSA) has published the winners of its 2017 Health + Wellness Design Awards™. These awards honor designers in the critical areas of our economy including: traditional medicine and healthcare, healthy lifestyles and nutrition, and public health messaging. For more than five decades, GDUSA has sponsored design competitions that spotlight areas of excellence and opportunity for creative professionals. The Health + Wellness Design Awards are open to everyone in the graphic arts community — including graphic design firms, advertising agencies, in-house corporate and institutional designers, publishers and other media. According to Gordon, the winners of the Health + Wellness Design Awards are among the most talented and effective designers working today. “They are the best and brightest the creative community has to offer,” said Kaye. An awards showcase appears in print, the web, as well as in digital format for desktop, tablet and phone. The Sponsor of this year’s competition is Erickson Stock.